In another life (or maybe in this life, further down the line), I must have worked with herbs. I absolutely adore them and love using them in everything from tea, to salves, to beauty. That's why I was so excited to come across Kore Herbal Alchemy: This all-natural beauty brand loves herbs just as much as me! Created by Korie Goodman, an herbalist (who also offers awesome workshops by the way), Kore Herbal Alchemy's entire line is relatively new. 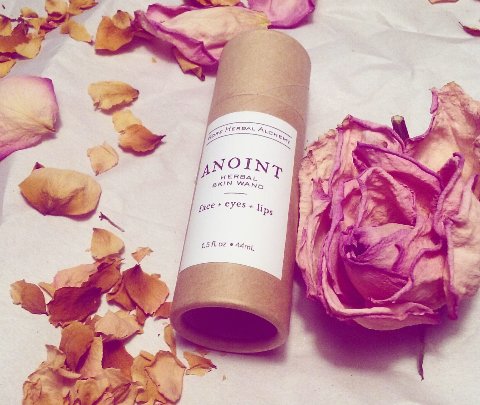 That said, this brand's mission is devoted to combining the healing power of plants with beauty products your skin will adore. To top it all off, their handmade products are packaged in eco-friendly containers and are very zero-waste friendly. That, to me, says a lot: Since starting my journey with zero waste living, I am constantly looking for beauty brands that share my ethics. This brand is great because all their products are packaged in glass jars, or biodegradable tubes (which can be composted, since they're made out of paper!). 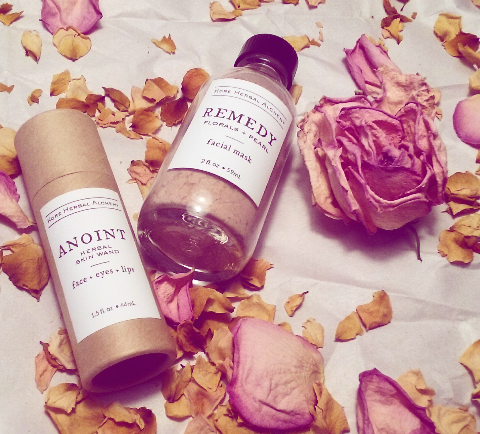 I had the honor of trying out Korie's anoint herbal skin wand and their remedy facial mask. The herbal wand is made from a compostable paper tube (so much better than a plastic tube), and the facial mask is stored in a cute jar. I'm totally reusing the jar when it runs out. Kore Herbal Alchemy also has other products available too though, such as ritual body scrub and rune scrub + mask (and both are packaged in glass jars, FYI). I'm sure there will be more fantastic products released in the future too, so you should definitely follow Kore Herbal Alchemy on Instagram to see what goodies they release next. 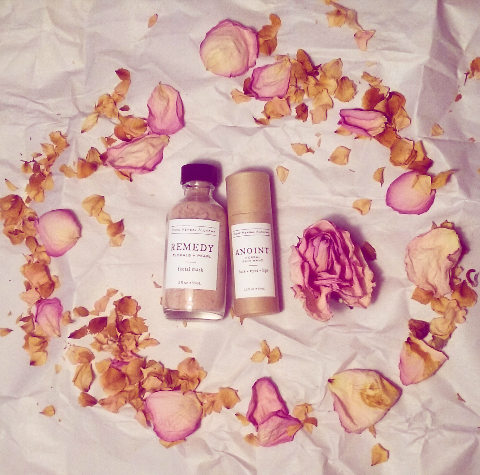 Now, are you ready to hear what I thought of the herbal skin wand and facial mask? Keep reading. Why you want it: This multitasking wand can be used as a moisturizer on almost any part of the skin (plus it's for all skin types - sweet!). My review: I love this stuff. I know that was blunt, but I'm being dead honest. It's absolutely amazing. When I first got it, I was so excited to give it a try, since I've never used one of these before. I was amazed when I read the back: Apparently it can be used "as a moisturizer after cleansing, as an under eye serum, a lip balm, or topically on small cuts or burns." Damn! That's pretty versatile. While I didn't use it to treat any cuts or burns (thankfully I don't have any on my body right now - and I'd like to keep it that way), I did use it as otherwise suggested. It's super easy to apply too: I simply popped the cap off, pushed the balm up, and applied it to any part of my skin that needed a little extra hydration. One or two swipes and I'm done! Lets just say my skin couldn't get enough of this stuff: As soon as I applied it, it soaked it up! Application went on very smooth and had an herbal scent to it that was very comforting and nonirritating. My favorite method of application by far was to apply it after cleansing my skin. You see, I have combination skin, so my cheeks and my forehead tend to dry out quicker than other areas on my face. So much so that certain areas of my face will actually start to get flaky (particularly my cheeks). So, after washing my makeup off at night, I habitually applied this stuff to the flaky areas. Then, I gently rubbed it in with my fingers. Almost instantly, it made the dryness disappear. And upon continued use (for a full week to be exact), morning and night, it the flakiness didn't come back! What a relief. Having this little wand around really made applying makeup even smoother (after all, blush and concealer don't exactly look amazing on flaky cheeks). It also gave my skin a soft, almost dewy glow. I also love putting this stuff on my lips: Instant hydration! When I'm in a pinch, I just apply a little to my lips and smack them together: They instantly become smoother and healthier! That's another thing I must point out: Less is more with this stuff, and because of that, it's bound to last a while. Totally a worthy investment. I also put it under my eyes too, if you were wondering, but I didn't notice as dramatic a difference as I did with other areas I applied this to. It did help decrease darkness and puffiness a little though, so that's something. More than likely, I would have to keep putting it under my eyes, morning and night, over the course of several months to see real substantial results. Still, overall, I would highly recommend this to anyone who wants a versatile moisturizer that's super easy to apply. If you have dry or combination skin, this will be a life changer for sure. Zero waste bonus: The wand is packaged in a biodegradable paper tube, so I can compost it when it's empty! Woohoo! Almond Oil Infusion of Lavender Flower, Yarrow Flower and Leaf, Dandelion, Beeswax, Vitamin E Extract, Essential Oils. Why you want it: This facial mask is perfect for brightening, toning, and smoothing skin! My review: As you might already know, I love facial masks. They're so luxurious and give me an excuse to pamper my skin. In addition, I'm also a rose fanatic. So, when I saw this particular mask is made with rose clay and also incorporates pink rose petal, I did a happy dance. Two of my favorite things joined forces! Yay! That aside, this mask is great for all skin types and combines vitamin rich florals with crushed pearl powder. Believe it or not, pearl powder has been used for decades to brighten and tone skin. And let me tell you, there's certainly something to it. But more on that in a bit. To apply the mask, I simply mixed two teaspoons of it with warm water in a small ceramic bowl. I think I added a teeny bit too much water to mine (it's supposed to look like a paste, not liquid), so be careful with how much water you add. Still, even if you do add a bit much, the mask is still perfectly fine to use! I scooped some up into my hands and applied it directly onto my face. I literally covered every area, leaving only my eyes and lips untouched (obviously). I must say I looked pretty unattractive, but I knew the results would be worth it. I left the mask on for a while, approximately 25 minutes. There was no set time to leave it on or anything, I just went with my gut. That, and I wanted to wait for it to completely dry before removing it. 25 minutes just seemed to be the magic number. When the time was up, I washed it off using warm water and gently patted my face dry with a towel. And guess what? I was impressed. My skin looked very well toned and had a revitalized, soft glow to it that was rejuvenating. Also, my skin felt very soft to the touch, which is always great, considering sometimes my skin can get rough and dry in certain areas (like on my cheeks). Now they felt as smooth as a baby's face! Suffice it to say I was impressed. It's recommended to do this mask once every week, and I'm sure I'll be doing exactly that until it runs out. On that day, I shall mourn, but until then, my skin will thank me! 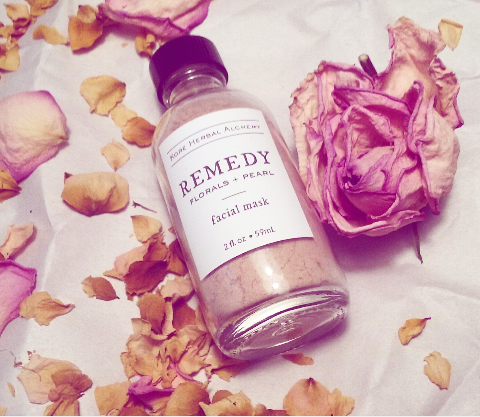 Zero waste bonus: The facial mask comes in a reusable glass jar! Score! Rose Clay, Lavender Flower, Pink Rose Petal, Dandelion Root, Yarrow Flower and Leaf, Pearl Powder, Essential Oils. I really loved communicating with Korie Goodman, who gave me the samples in the first place. She was very sweet and I could tell she loves what she does! I love how the products are zero waste friendly: They're packaged in glass bottles and biodegradable paper tubs! I haven't finished using any of these products yet - they should each last me about a month or more! Half the ingredients could be grown in a garden (or in my case, an indoor container garden). The instructions are easy to follow and are included right on the packaging and shop. Both products actually do what they promise to do - no fibs here! There are so many health benefits to using the ingredients in these products (after all, half of the ingredients used can actually be consumed). My skin felt absolutely amazing after using each product (the facial mask didn't feel too tight when it dried and the skin wand was very light instead of heavy on my skin). The cons: There was only one con - but it's very important in terms of zero waste living. When these products were shipped to me, the package containing them had a lot of plastic bubble wrap, and even a mini plastic bag in it. I understand this was designed to protect the products, but it was excessive and defeated the purpose of the zero waste containers the products were in. I hope Korie chooses to use only paper packaging (like boxes and shredded newspaper) to cushion her products in the future. To her credit though, Korie did use a recyclable plastic bubble mailer (made from Plastic 2 + 4) as well as some tissue paper to protect the products as well. This means I can recycle the plastic and upcycle the tissue paper (so it works out). Conclusion: I highly recommend Kore Herbal Alchemy. Their products actually work and are completely all-natural. The containers their products come in are also very zero waste. However, there are some things that could stand to be a little more zero waste about them (like the actual package the products shipped in). That said, this is a new brand, so I'm sure these things will be tweaked over time. Korie seems like the sort of person who truly loves the environment and would be willing to make her packaging just as zero waste as her products. However, I intend to recycle the plastic that came from her product, so there's not much to worry about. I'm also going to reuse the tissue paper (my mom's birthday is coming up after all), so again, I won't send anything to a landfill. Also there's something else to consider: The package she'll be sending to her customers could be different than the one she sent to me. I guess it all depends on what she decides is best and economical at the time. If this is a real concern to you, and you still want to try her products, just reach out to her and let her know! I'm sure she will be able to accommodate you and send your package as zero waste as possible (she's extremely nice and was a pleasure to work with). All in all, I'm very impressed with this brand and cannot wait to see what else they have in store and any improvements they make along the way! Be sure to follow Kore Herbal Alchemy on Instagram, Facebook, and Pinterest to be a part of their all-natural, eco-friendly journey! This post was sponsored by Kore Herbal Alchemy. All thoughts remain honest and not influenced by a third party.